What are Podcast Show Notes and Are They Necessary? What are podcast show notes, and are they even necessary? First, think of podcast show notes like a synopsis to a book. Show notes are text (typically set up as a blog post) that describe any individual podcast episode. They can include information about the episode, guest information (including guest photo and bio), links to any resources or information mentioned in the episode, and highlight topics (usually as bullet points). Show notes can be short and concise or long and descriptive. So are show notes actually necessary? Well, I can count the times I’ve personally looked at show notes after listening to a podcast on one hand. And I can bet the same holds true for many other podcast listeners. BUT, by posting show notes on your website or blog, you greatly increase the SEO (search engine optimization) for your website. Search engines love new content, so for SEO alone, I encourage you to create show notes for your podcast episodes. Further, someone may stumble upon your website or blog for the first time and know nothing about you or your podcast. By posting show notes (even concise ones) you provide them the opportunity to get to learn more about you and your work through the power of words. Organize Your Content and Podcast Files, Like a Pro! Whether you are creating a podcast, writing blog posts, or writing a weekly or monthly newsletter, organization will help keep you on track. Organizing helps you: create a plan, keep things concise, and keep your goals within sight. A great way to organize your thoughts for content creation is by having a content creation calendar. You can find templates for content calendars all over the web. Co-schedule put one out at the end of 2018, and you can find that here. Or you can simply create one using Google Calendar. Putting your ideas down for blog posts, along with the dates they will be published, will help you map out your content in an easy and visual way. If calendars aren’t your thing, you can also create a Google Document and map out a month’s worth of content in it. The spreadsheet also includes columns for checking off items as they are done, for example: is the audio back from the editor, is the episode uploaded to Libsyn, or is the social media content scheduled? The spreadsheet is our way of making sure we are hitting all aspects of production for their podcast. Additionally, the spreadsheet serves as a resource to look back upon for topic ideas, referencing links for sharing past episodes, and guest contact information. There are other spreadsheets I create for clients to help keep things organized as it relates to their podcast too. This includes spreadsheets to track guest research, coordination and vetting, plus guest pitching. I’ve created a template of the various spreadsheets you can use to organize your podcast episodes, guest coordination, guest research, vetting, and even podcast pitching. 👉 You can download it here. Remember, it’s not necessarily what you use to organize your podcast and content creation, but that you actually DO use the tools that work best for you. When you become organized, the work doesn’t seem so tedious or hard. In fact, it can become fun and light, because the focus of where you want to go is crystal clear and fully formed. Happy organizing! An audiogram is a video file (.mp4) that has a static image and includes audio. It’s a unique way to share content on social media or on your website. Check out the short video tutorial below to learn how to create an audiogram in 4 easy steps. And, be sure to grab my, Audiogram Creation Cheat Sheet, which includes additional tips, size and length specifications for various social networks and more. Grab your copy here! If the image does not load, click here to watch the video. Is there any reason why you shouldn't host a podcast? Up this month, I answer the question: “Is there any reason a person shouldn’t host their own podcast?” Find out the answer, as you listen to an excerpt of my interview with Terry Green of BizEase Support Solutions, which includes three things you should consider before starting a podcast. In short: If you have a passion for a topic and a willingness to share your expertise, podcasting can be of value to you and your audience. Speakers and coaches, typically, have a message to share. Therefore, podcasting is a great platform for them to share said message in a fun and unique way. Podcasting is a great way to express oneself, be authentic and connect with your intended audience. Podcasting, is it for you? Everyone seems to have a podcast these days. Right? So the question I ask of you, is having a podcast right for you?Let's discuss, shall we? First, podcasting has been around for over a decade. It's not new and will be around for many years to come. Second, while it seems everyone has a podcast; it doesn’t necessarily mean that everyone should be podcasting. Do you have a topic that you are passionate about and can talk about endlessly, without tiring? Are you are creating a podcast, “just because you feel like you are going to ‘miss the boat’ on this whole podcasting craze”? Do you have at least 2-3 hours a month to devote to your podcast? If you’ve answered NO to questions #1 and #3, and YES to question #2, you may not be ready to start a podcast. Yet. Why you want to create a podcast. Determine your why. Brainstorm topics you are passionate about. Figure out your what. Devise a plan to help with time management. Create a plan to implement the production of your podcast. The plan can include outsourcing some podcast production tasks. Once you’ve worked out the three parts above, you should be ready to move on and get started with your new podcast! The main point of this post is to make it clear that podcasting is absolutely an awesome way to market and establish yourself as an expert in your niche. But, it's not the only arsenal in your toolbox. If it's not for you, that's okay! Don't force it. There are ways in which you can still share your knowledge and market your business in the digital world. Like: be a guest speaker on other podcasts, host or speak at online events, create videos or turn to blogging. Want to find out what is involved in starting your own podcast? I offer podcast strategy sessions. Contact me today, to get started! A brand may refer to your business or a product. More often, when it comes to podcasting, you are the brand. Creating a podcast for your business or for self-branding is a great way to market your services, products or a topic that is super important to you. More importantly it establishes you as the go-to person for your chosen topic– much like article writing and blogging. With the growth in sales of smartphones, media technology and other mobile devices, creating a podcast for your business is a great marketing tool, now more than ever. Reason 1: It’s an opportunity to talk to your “peeps”. Podcasting is a perfect way to get in front of a specific audience (your target market) and talk about a specific topic you are passionate about. Reason 2: Podcasting is the gift that keeps on giving. Really it is. Once you produce a podcast and place it on the World Wide Web for others to hear, it is there forever (or at least until you decide to take it offline). A podcast episode you aired in 2013, although old news to you, at some point, will be new to someone else. Reason 3: It makes marketing fun! Some folks look at marketing as a long drawn out task they have to do in order to market their business, product or passion. If you like to talk, share your expertise and experiences — then podcasting is a fun marketing tool to use. When it is fun, it doesn’t feel like work… now does it? Bottom Line: Podcasting is a way for you to provide quality content to your target market. It should be content they value, which will ultimately lead to them liking, knowing and trusting you. It helps build your brand, it helps your target audience to connect with YOU. Turning subscribers into fans and filling your marketing funnel - next week on the DV Blog! People like to talk about their business, themselves and their area of expertise. If you show an interest in what they have to say, they'll most likely be happy to come on your show to chat. All you have to do is ask. Of course, some people may not have the time or inclination. That's okay. Understand that a response like, "No, thank you," does not mean failure. Move on to the next prospect. Keep going. Now that we've gotten the facts out of the way. Here are some tips for finding guests for your podcast. Reach out to other hosts in your podcast genre to see if they would be a guest on your show. I've done this in the past and hosts are almost always happy to oblige. Plus, it might allow for some cross promotion too. Social media is your friend! Find guests on Twitter, Facebook, etc. You follow people you like, I am sure. A quick direct message invite to someone that has caught your eye, is all it takes. Seriously, it is that easy. When I first started production of, A Virtual Perception, Twitter was my go-to place for finding and conversing with potential guests. Invite people you know. If you are new to podcasting, it's a good idea to start with guests that you know. Invite friends, associates, clients or even family members. This will allow you to hone your interview skills. Then branch out from there. When you do branch out, don't limit yourself! Maybe there is a particular person that you've always wanted to have on your show, but because of their status you feel intimidated. First, stop that! Second, INVITE THEM. Don't limit yourself. Once you realize this, the podcast guest floodgates will open. Bottom line: People LOVE to talk about their area of expertise. If you see they are chattering about it on social media or on their website (via a blog, etc) - nine times out of ten they are going to say yes if you invite them. It's just a matter of reaching out and asking. Create a podcast around a topic you are passionate about. 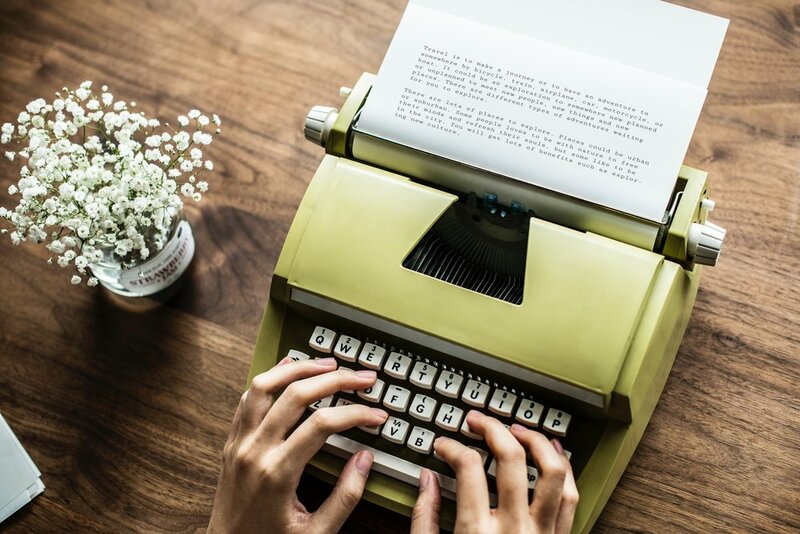 You may have heard me discuss this before – so I am going to simplify this rule: Passion keeps you motivated and allows you to put your very best content out to the public. A podcast topic you are excited about and can’t wait to share with others – that’s what you want. Your enthusiasm will come through! Make it easy for people to find your podcast! Have podcast, listeners will come. Right? Yeah, not so much. The main point of having a podcast, especially if you are incorporating podcasting into your marketing plan, is to gain exposure. Like everything else in business, having a podcast takes work. First step: Be sure your podcast gets the proper exposure by posting it: to various podcast directories (like iTunes, Stitcher, industry-related podcast directories, and now even Google Play! ), on your website, on your social media accounts, on your business card and email signature. I’ll be sharing other ways to promote your podcast in a future post. Be Yourself. I can’t say this enough. Your podcast is an extension of who you are and what you do. Always. People want to get to know, like and trust the people they do business with; your podcast is the perfect tool for this. Be yourself; those that want to do business with you, will. Those who don’t necessarily ‘get’ you…well, they probably aren’t your ideal client anyway. There you have it. 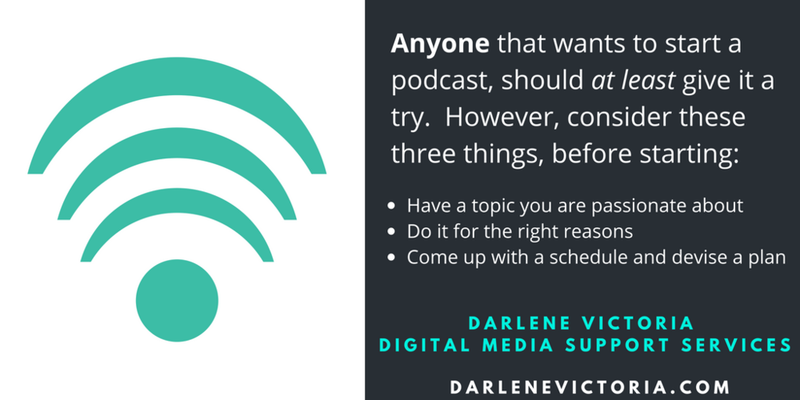 My “3 Rules of Podcasting for Business.” Of course, there are more…there are always more, yes? But if you start out understanding these first 3, you are well on your way to understanding how to make a podcast work for you and your business! Need help launching your podcast or submitting it to podcast directories, like iTunes and Google Play? I can help! Online Video & Podcasts: Nobody else is doing it, why should I? "Nobody else in my industry is doing it." EXACTLY! If few people in your industry are using online media for promotion, you have an opportunity to establish yourself as the go to person or expert in your niche. Online video and podcasting are both great ways to extend your marketing reach globally, without spending loads of money on newspaper, radio or other traditional advertising. That's not to say you shouldn't use traditional marketing methods, but my advice is that you don't ignore your online market or reach. If you pay attention to your online market, you could potentially catapult your business to the next level. According to statista.com, in 2013, the number of digital video viewers in the United States amounted to 195.6 million and, it was also found that 33% of US adults listened to audience as of 2015. Chances are, that at least a percentage of those viewers or listeners make up are your ideal clients. Creating video or podcasts these days, is super simple. If you have a smartphone, a computer, a microphone and some editing software (or someone that you can partner with to make your final productions shine), you can promote your business online! The next time your PR rep or marketing professional says to you, "Let's add a podcast to our marketing plan," don't immediately dismiss it. Remember, if you don't try, you'll never know. And, as a advocate for podcasting to help promote business, the most important thing to remember is that online media allows your market to get to know, like and trust you. When you are able to do that, your bottom line will greatly improve! Need help with your online marketing support? I've got you covered! I'd love to speak with you to see how I can help. I talk a lot about podcasting for your business on my site and my blog. But, you can also create a podcast on a variety of other non-business topics. The single most important thing to remember when it comes to creating your next podcast is this: create one that is on a topic that you are most passionate about. Given that point, podcasting about a cause you believe in or support is a fantastic way to jump into the world of podcasting! Let me put this into perspective. Imagine you are someone that supports a local animal rescue, going as far as volunteering in your spare time to help care for the animals and fund raise for the group. You love the animals, enjoy working with the other volunteers and have an overwhelming sense of happiness helping out. Now, let’s take this one step further; you want to do more. You want everyone to know about this wonderful group, the animals that need adopting and encourage others to adopt from a shelter or rescue. Well, a podcast is a perfect outlet! With a podcast you can: share your knowledge about the rescue with a specific audience, list it in several podcast directories (including iTunes and Stitcher) , share on social media streams for even more exposure and reach people across the nation AND in your own backyard. Right about now, you may be thinking, “Yeah, okay, Darlene … this all sounds great, but what on earth do I even talk about? Won’t animal rescue chat get old, fast?” First, if you are passionate about your chosen topic, talking about it will never get old. Second, there is something simple you can do now in order to fill your ‘idea bucket’ . It’s good old-fashioned brainstorming! When it comes to podcasting, I like to break brainstorming up into two step process. STEP 1: Brainstorm and come up with the overall topic for your podcast. Think of the overall topic for your podcast as the outside of your idea bucket. You should be able to tell someone you’ve never met, in one sentence, what your overall podcast is about. Take for example my podcast, Inspired Entrepreneur’s Guide. I tell people it is the podcast that encourages new entrepreneurs and entrepreneurs in a funk to stop dreaming and start doing. It gives them just enough to get an idea of what the show is about. It also keeps me on track when creating future episodes. The same will hold true for you. Remember, the overall topic is the outside of your bucket. STEP 2: Once you’ve decided on an overall topic for your show, start brainstorming topic ideas for each individual episode. The episode ideas are what goes into your bucket. Fill that bucket up, okay?! Not sure where to start? Here are some ideas: - Your first episode can be an introduction to your rescue group, yourself and what to expect in future episodes. - Your second episode will be an interview with a volunteer. - And your third, well, interview a pet owner that has adopted a rescue. By the fourth you can start to branch out and interview other rescue groups. Then continue to extend these ideas further –training tips for a newly adopted rescue dog, rehabilitation, current issues with euthanasia laws for rescues, etc. As you can see, a little brainstorming in the beginning can go a long way. Always keep the reason for your podcast in mind and your overall topic in check. They will be your guide! If you have questions or need help, I am here. I love helping people get started with podcasting for their business or their cause. Contact me at any time for help! A couple of weeks ago, I shared a post called, “Preparing for your First Podcast Interview.” It provided tips to first-time podcast guests. This week I’d like to offer some advice to new podcast hosts. As a new host, you may be feeling a bit nervous and excited about hosting your first interview. That’s great! It is an exciting time. I firmly believe that preparation is the key to tackling any nerves you may be feeling. Follow the tips below and you’ll be feeling less nervous and more confident going into your first interview. Familiarity goes a long way – if this is truly your first podcast interview, start out interviewing someone you like, know and trust. My very first podcast interview was with my mother (yes, my mom! ), a client and a very sweet business associate of mine. You can listen to my very first podcast interview, here (recorded way back in 2008!). Go into your interview with the mindset of - this is just a conversation between friends. Interview people you know, at least for the first few episodes. Doing so will help you to solidify the “conversation with friends” concept firmly into your psyche. Then, once you realize the interview process is simply a conversation and not something intimidating, scary or complex – branch out to interviewing others. Do your research – Researching your guest well before you even invite them to be on your show, is important! Don’t skip this step. You want to have a good idea for a show topic first, once you have that, research various people that you think might fit into that topic well. Then go one step further to see if they are someone you may be able to connect with during a conversation. View their social media profiles. Do you get a sense that they are a person you might like to hang out with and do they offer resourceful information to their followers? If the answer is yes to both of these questions – add them to the list of people you would like to interview. Always have a short list of people to invite, by the way. It will come into play when you start inviting guests. See the next point for further clarification. Start inviting guests, don't doubt yourself – A lot of times, new podcast hosts question whether or not they should invite a particular person onto their show. Doubt creeps in, well before you even send an email invitation! It's not uncommon to think things like, “Oh they may be too busy,” “They’re too high profile and would never want to chat with me,”or “I bet they’ll say no, why bother?” Stop that! Don’t overwhelm yourself with doubt! Guess what? The worst thing that can happen is that they say, "No." No big deal. Simply move on to the next person on your list. Chances are though, they will say yes. People love to talk about their business and more importantly, they love to talk about a topic they are passionate about. Your interview is scheduled; research some more – Your interview is scheduled. Awesome! Prior to your call, it’s super important to have an idea of what you will talk about with your guest. One thing you should always do is create a list of questions you would like to ask. This is where additional research will come in. Look at their website and social media profiles again – this time formulate questions that highlight their expertise and passion. Generic questions are okay – but the real magic happens when you can show your guest that you’ve done your homework and have taken an interest (a true interest) in them and what they do. Finally, be 100% involved in the interview and ask follow-up questions – Being 100% involved in the conversation, when it comes to the actual interview, is the single most important thing you can do. Turn off any distractions – cell phones, music, etc. If you are able to turn off your computer, do it. If not, be sure all email, social media and other notifications are turned off. Listen to your guest, ask follow-up questions about something they've just said and truly give your time to them. They’ll notice and end up becoming more relaxed, thus making your interview that much more enjoyable, fun and easy to do. So much so, you'll be hyped to do another one again, soon! Good luck. I know you will do great! Questions or comments about this post? Leave them below. Check out my newest podcast, The Inspired Entrepreneur’s Guide for guest interviews and more. Need help with producing your podcast? Learn how I can help or let’s chat! Next time, I'll write about what to do if you run into technical difficulties during an interview or how to handle a major goof-up. Hint: you can recover, I'll tell you how.